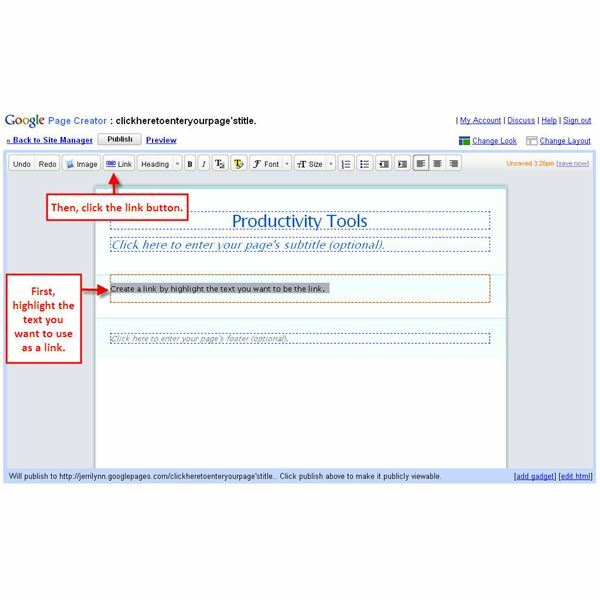 Here’s where things get a little hinky when it comes to creating your web site with Google Page Creator. You could search for hours for a way to add pages to your site and probably would never figure it out. But there’s a reason for that. To create a multi-page web site with Google Page Creator, you actually need to create separate pages and link them together. That is, you designate a word or words that, when clicked, will take the uesr to a different page. It’s a bit cumbersome, but it works. NOTE: Before you do anything you need to create the first page of your web site. The instructions in the series Create Your Web Page Using Google Page Creator should get you through it without too much trouble. 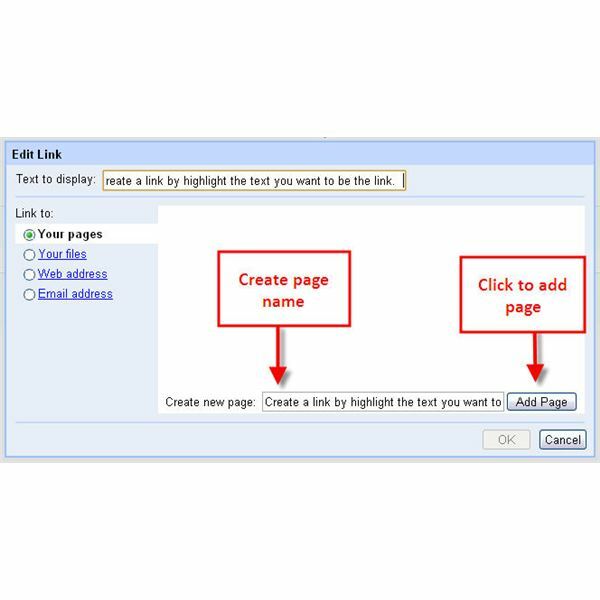 Once you have the page created, highlight the word or words that you want to use as a link for your page. When you’re creating the first page in your Web site, choose a column layout for it; then you can use one of the columns to list the links to other pages in the site. You can also just include the links throughout the text on your page, as described previously. But this tip is just a little niftier way for users to navigate. After you’ve highlighted the text you want to use as a link, click the Link button, as shown in Figure 1. When you click the Link button, and Edit Link dialog box appears (shown in Figure 2). In the dialog box, enter a name for the page (hint: make it the same name you are using for the link) and then click the Add Page button. The new page will be added to the list of pages shown in the dialog box. You can repeat this process as many times as you need to in order to create the number of pages you’d like in your web site. But remember that the last page you create will be page link displayed on your web site. When you’re finished adding pages, click OK to return to your web site. Once you’re back on your page, you can add the additional pages that you created by adding the link text, highlighting it, click Link, and then selecting the page that you want the text to link to.